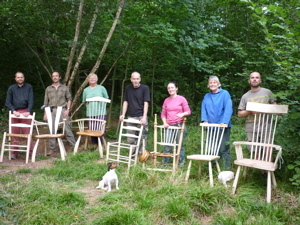 7 day Green Woodwork & Chair Making. 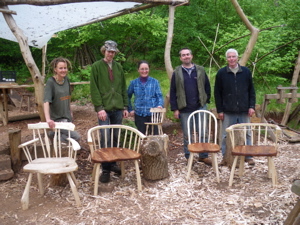 After an introduction to green woodworking you can then choose to concentrate on making a Welsh stick or a Windsor dining chair with solid adzed seat. 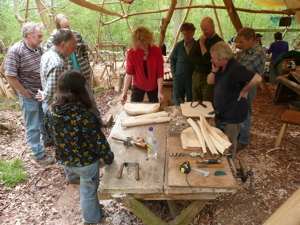 Alternatively you can design and make your own chair or make a pole lathe and shavehorse for your home workshop. I have extended this course to 7 days allowing an extra half day's tuition and an afternoon free in the middle of the course. This allows me to keep the price reasonable and course students can either go off sight seeing, relax or continue in the workshop at their own risk. There is a materials charge for seating, from £10 to £50. 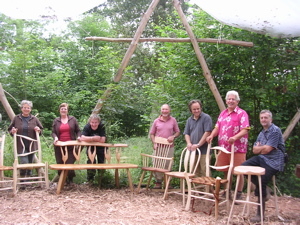 Welsh stick chairs June 2009. 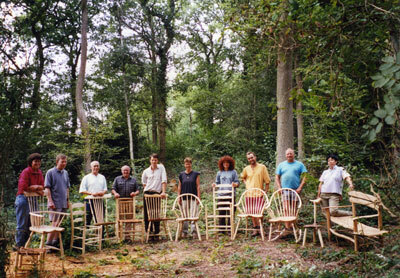 9 day Chair Making Workshop. This course starts on Saturday afternoon and runs until the following Sunday afternoon. 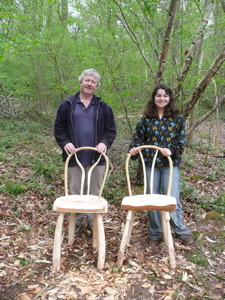 It offers a chance to tackle a more complex chair or, alternatively, to combine the pleasures of making with a more relaxed time in the woods. 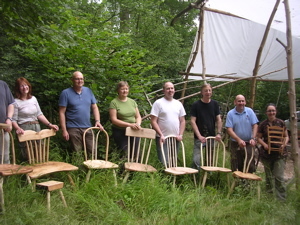 Tuition focuses on the design, construction and finishing of Windsor and Welsh Stick chairs (with an adzed elm seat and steam bent arm) on the August courses and Clissett style ladderback chairs (with steam bent back posts) on the July course. The latter can be rush seated during the last two days under the expert tuition of Sheila Wynter. The 9 day courses include a free half day as in the 7 day course.